Stay away from small turtles: they are behind four separate salmonella outbreaks that sickened 133 people across the U.S. since last year, according to the Centers for Disease Control and Prevention. In an announcement today, the CDC said epidemiological and laboratory tests have confirmed the outbreaks were linked to contact with small turtles or their environments (i.e. water from a turtle habitat). Of the 133 people infected, 38 were hospitalized, though no deaths were reported. Many of those infected -- 41 percent -- were children ages five and younger. The outbreaks spanned 26 states across the country from January 2015 to April 2016. 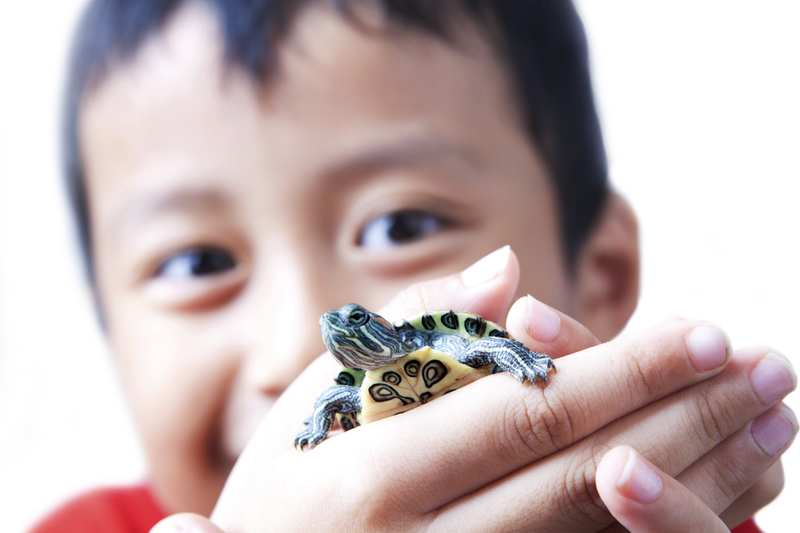 In interviews, 50 percent of affected people said they had contact with small turtles or small turtle environments before falling ill. Among those who reported contact, almost half said they had purchased the turtles from street vendors or received them as gifts. The CDC warns that all turtles, regardless of size, can carry Salmonella bacteria even if they look healthy and clean. Salmonella, which is most often spread through contaminated food, causes diarrhea, fever, and abdominal cramps. Most people recover after a few days, but in severe cases patients may need to be hospitalized and could be at risk of a life-threatening bloodstream infection. The CDC says it expects the salmonella outbreaks to continue at a "low level" for the next several months, since people are still largely unaware of the risks of infection from turtles. Health officials warn that all turtles can carry salmonella bacteria, regardless of their size or whether they appear healthy or clean. Salmonella germs are shed in reptile feces and can easily contaminate reptile bodies and habitats, and then spread to humans. The FDA banned the sale and distribution of turtles with a shell length of less than four inches in 1975, due to the risk of salmonella infections. The CDC collaborated with state governments, U.S. Fish & Wildlife Service, the Department of Agriculture, and the Food & Drug Administration to monitor and investigate the outbreaks.